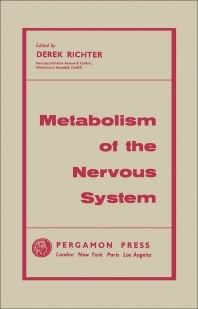 Metabolism of the Nervous System contains the proceedings of the 2nd International Neurochemical Symposium, held at Aarhus, Denmark, in July 1956. The book discusses the molecular structure and morphology of the adult nervous tissue; the chemical composition and cytochemical localization of adult nervous tissue; and the permeability and blood-brain barrier. The text also describes topics on electrolytes and nervous conduction; the metabolism of isolated nerve and ganglion; and the metabolism of the brain in vivo. The metabolism of brain tissue preparations in vitro; energy metabolism and coenzymes in relation to the nervous system; and lipid and fatty acid metabolism are also considered. The book further tackles nucleic acid metabolism; protein and amino acid metabolism; and cholinergic and non-cholinergic transmission. The text also discusses other pharmacologically active compounds related to the adult nervous tissue.